My step-father Frank took this photo during World War II. 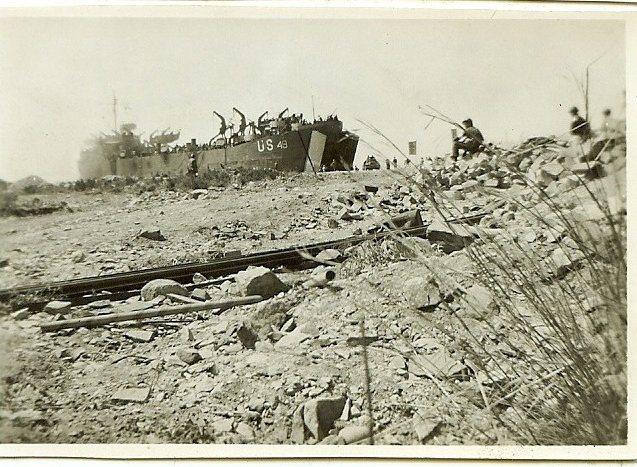 On the back of the photo he wrote, "An LST unloading at Green Beach on D-Day. Notice how calm things look." Green Beach was a section of Omaha Beach on the coast of Normandy, France where the troops landed on D-Day - June 6, 1944. USS LST 49 is a Landing Ship Tank created during World War II to carry vehicles, cargo, and troops landing directly on the shore. Frank never talked about the war. He didn't want to be called a hero. He was modest. Sometimes I thought I could see memories flashing in his eyes. I wanted to know more but if you asked him specifics, he'd deftly change the subject. World War II definitely had an impact on him. Let's remember those who served, but if you're going to thank them for that service, think about why you're doing it. Yes, my dad was the same, never talked about it. He was in the 2nd wave in June 1944 and drove a tank. Ali and me went to Arromanche a few years ago and to actually see the beaches is a very sobering experience. The cliffs at Omaha beach are massive and you can see how difficult it must have been for them to get a toehold on it.